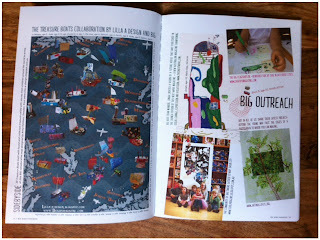 A few months ago Lilla-a Designs put out a call for her next exhibition, Treasure Boats. Every few months she holds an exhibition where she invites children to make a work of art on a theme and submit it. She then takes all the artworks and puts them together in an exhibition on her blog. I love the open ended creativity of these exhibitions and seeing all the different things kids come up with. We have participated in a few of the other exhibitions, so when I brought the treasure boat theme up to the Bee she was in. 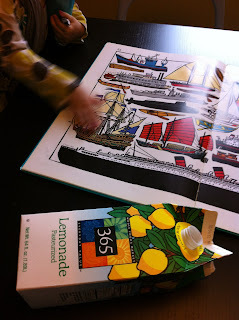 After talking for a few minutes about treasure boats she suggested we pull out our Almost Everything book to look at some boats. The one she liked most was a large Spanish Galleon with three sails, so that was the inspiration for her design. I found an empty juice carton and grabbed some other materials out of our recycling bin for her to pick from. She used three straws for the sails and then cut a wrapper up to make the sails. I helped out with a little hot gluing to get the sails to stay in place and then we were ready for the maiden voyage. We filled the sink with a little water and placed the boat in. The girls were delighted when it floated and even more delighted to act like the wind and blow the boat around. When we were all done I asked the Bee to tell me a little about the treasure being carried in her boat. She told me "My Boat is called the Brice (that's the name of a little boy in her pre-school class), it has a mermaid on it and likes sailing in the bathtub. Inside the boat is a treasure of a golden necklace, a golden pirate and a golden ring." The final Treasure Boat Exhibition can be seen at Lilla-a Designs or in the newest edition of Big Kids Magazine (right next to a photo of the Baltimore Treasure Map project we participated in this winter with our friends from aMuse Toys, Classic Play and Cool Progeny.) The Bee was so excited to see her work in the magazine and we have loved looking at the rest of the awesome, creative work in there!